PNNL’s hydrothermal liquefaction system turns wet biomass—such as algae, sewage, and plant matter—into biocrude in a matter of minutes. If you've ever been to a corn field after harvest, you've seen the mass of leaves, husks and cobs remaining on the ground. That's corn stover, and the U.S. makes a lot of it—more than 100 million tons every year. This plentiful farm byproduct can be turned into fuel, but it poses stubborn challenges for scientists aiming to make the process efficient and affordable. By combining two promising techniques, PNNL scientists have demonstrated a way to double the fuel that can be extracted from the same quantity of corn stover. First, they grow oleaginous yeast on sugars extracted from the plant material, making a thick, lipid-rich broth. In the second phase, the broth is mixed with residual lignin from the corn stover, and then converted to “biocrude” oil via a high temperature and pressure process called hydrothermal liquefaction (HTL). The biocrude, which is loaded with hydrocarbons, can then be used to make renewable diesel, jet, and marine fuel. The work, supported by DOE’s Bioenergy Technologies Office, was recently published in the journal Applied Energy. Brewer’s yeast is commonly used in biomass refineries to ferment the sugars in plant matter and turn them into ethanol. In PNNL’s new study, a different type, oleaginous yeast, was used because it is particularly good at making lipids that can be upgraded to diesel fuel. However, when these yeasts are grown in a bioreactor using unrefined sugars from corn stover, the resulting lipids aren’t easy to extract from the broth. "In our paper, we show a way to sidestep the problem of separating out the fuel compound," says Jim Collett, a bioprocess scientist at PNNL and lead author. "We just take the whole bioreactor broth to HTL." With HTL, the corn stover broth goes into a reactor where it meets heat up to 625 Kelvin (665 °F) and pressure up to 22 megapascal (nearly 3,200 pounds per square inch). What emerges is biocrude, liquid and some ash. After some chemical upgrading, the biocrude can be blended into renewable diesel or fuel for jets and ships. This process solves a long-standing problem with corn residue: How to make use of lignin, the tough organic substance that lends the stover its reedy quality. Lignin separates from the stover during the initial phase, when it is mixed with water and pretreated with caustic chemicals. But the yeasts can't break down and eat the lignin within the bioreactor, so it typically becomes waste, perhaps to be burned at the biorefinery to produce steam and electricity. In their new approach, PNNL researchers combined the leftover lignin with the oily yeast grown on the corn stover sugars, using HTL to derive biocrude from both. Previous research has tested HTL directly on biomass, and other work at PNNL has used HTL to derive biocrude from wastewater treatment sludge. But the idea of combining the oily yeast broth, lignin, and HTL in one process to make biocrude from corn stover is new, the researchers write. That said, it doesn't require a biorefinery to be rebuilt from scratch. 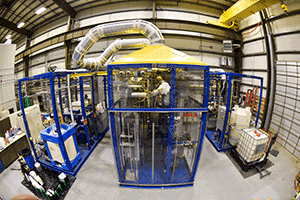 "We can take an existing bioconversion plant design and add the HTL operation," Collett says, "Instead of sending the lignin to be burnt for heat and power, we can direct it toward fuel." The researchers estimate that a biorefinery based on their new hybrid design could produce about 51 million gallons of gasoline equivalent (gge) fuel from about 800,000 tons of corn stover per year, up from a range of 24 to 32 million gge per year for a similar plant without HTL. Still, the researchers' preliminary economic analysis found that the estimated cost of making this fuel—around $5 per gge—would need to come down further in order to be viable. About a fifth of the corn stover's carbon gets stranded in the liquid byproduct from HTL, which also contains a mix of nitrogen, sulfur, chloride, and other chemicals. Future research will focus on finding ways to harvest that liquid for energy and valuable chemicals. "We're trying to see how we can extract more value out of anything else that was formerly considered waste," Collett says, "and turn that into fuel as well."